HTET is stands for “ Haryana Teacher Eligibility test”. This examination conducted by Haryana Government every year to select candidates for teaching profession in various schools. This year notification is out related to the HTET Examination 2018. We shared this information on the basis of that official notice only. We also shared the official file link under IMPORTANT LINK section at the last of this article. So those whoa re wishing to grab a Government job under teaching profession can apply for this HTET Examination 2018. More information related to this HTET Exam is given below in this article. Read it carefully before applying. For Primary Teacher Posts(Level-1): Those who have passed in 10+2/Intermediate with minimum of 50% Marks and also Passed / Appearing 2 Year Diploma in one of the following line: “Elementary Education / Special Education / B.E.Ed”. Candidates who have a Bachelor Degree in Any Stream and Passed / Appearing 2 Year Diploma in Elementary Education / Special Education / B.E.Ed can also apply for this Level-1. For TGT Teacher (Class 6th to 8th ): Applicants having a Bachelor Degree in Any Stream with minimum of 50% Marks and also have 2 Year Diploma in Elementary Education. 12TH pass candidates with 50% Marks and 4 Year BA B.Ed / B.Com B.Ed Degree can also apply. For PGT Teachers: Those who have a Master Degree in Concerned Subject with minimum of 50% Marks and having a B.Ed Degree can apply for these posts. 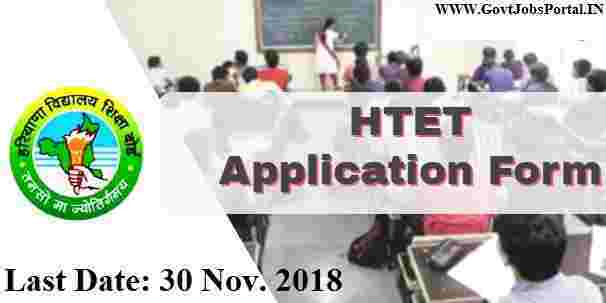 In the table below we are going to explain about the various Application fee structure to apply for this HTET Recruitment 2018. Various Category candidates have to pay the various application fee. Check the table below for more information. Paying Method: Applicants can pay the examination fee through one of the following methods: “Debit Card, Credit Card, Net Banking”. You can choose one of these method for the payment of the application fee. 19TH Nov. 2018 is the Opening Date. 30th Nov. 2018 is the Last Date. Disclaimer: We took this information from the following PDF file: “ http://htetonline.com/PDF/HTET_Information_Bulletin.pdf”. So all the rights of the above information goes to this file only.